Keep your pets vaccinations up to date and keep a copy of the paperwork easily accessible. Shelters require proof of vaccines. Be sure to have collars with ID tags and rabies tags for each of your pets. Always include your area code on the phone number listed. Spay and neuter your pets, so your pet wont get pregnant or impregnate if loose during a disaster. Make a list of safe havens for your pet during a disaster. Veterinary Clinics, Pet Friendly Hotels, Shelters, Friends and Relatives already designated. 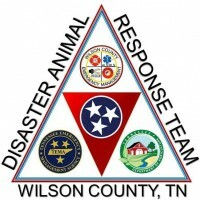 Have a friend or neighbor lined up to check on your animals if you are working or away from home when a disaster strikes. Keep an emergency kit available at all times and rotate the stock.Keep a two week supply of food and water on hand. Every family member should have a role in evacuation. This should be planned and rehearsed ahead of a disaster. Practice loading and evacuating with your animals. Place stickers on front and back entry ways, barn doors and pasture entrances to notify emergency personnel that animals are present. Have photos of you and your pet together for proof of ownership,in your emergency kit. Bring your pets inside well in advance and reassure them. Pets are frightened by unfamiliar noises and abnormal weather changes. Keep your pet in sight at all times. Reassure. Never tranquilize your pet. It inhibits their natural instincts to survive and escape potential danger. Have your emergency kit close at hand. Be ready to shelter in place at home. Help re-orient your pets by walking them on a leash. They may be confused if landmarks and scents are altered. Be on the look out for downed power lines , debris and reptiles brought in with flood waters. Do not allow your pet to drink water or eat food that could be contaminated. Animals can become aggressive or defensive after a disaster after a disaster. Their Flight or Fight instinct kicks in. Monitor their behavior and notify your vet if this behavior does not subside. In the days and weeks after a natural disaster, displaced people and animals face many dangers. Especially when people evacuate expecting to return home in just a few days, going back into a disaster site can present a life threatening situation. Always evacuate with your animals! Homes, landmarks, and familiar scents that animals use to find their way home or recognize safe areas can simply vanish in a disaster. This causes disorientation, panic, stress and leads dogs and cats to seek refuge in hazardous situations. Flood waters contaminated with waste and bacteria can cause gastroenteritis and intestinal parasites. Most forms of bacteria are transmitted to people and animals resulting in wide spread infections. Floating hazards such as building materials, street signs, and tree limbs can cause serious injury to humans and animals. Animals trying to swim in flood waters can become quickly exhausted and drown. In addition to water supplies, food sources may become contaminated and animals do not understand that they shouldn’t be drink standing water or eat contaminated food.